Everyone knows that Freedom to Work is an important issue this year, especially as the August 7 election gets closer. What you may not know is some of the state and national data that reveals exactly why Freedom to Work is right for Missouri. Prop A will ask voters if the worker freedom protections that became law in 2017 should be adopted. The law ensures that all Missouri workers have the choice of whether or not they want to join and pay dues to a labor union. As you head to the polls next month, here are 10 Freedom to Work facts and stats to keep in mind. 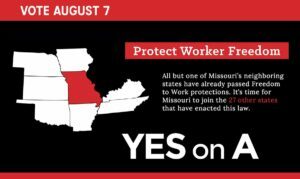 Every one of Missouri’s neighbor states, except Illinois, have already passed Freedom to Work protections. If Missouri joins the 27 other states in the U.S. that have enacted this law, we can finally compete on a level playing field for jobs and business investment. Site selectors turn a blind eye to Missouri and other states that mandate union membership. When Gallup interviewed national site selectors, they learned Missouri is losing a staggering 40 percent of potential company relocation and expansion opportunities because we don’t have Freedom to Work. There’s absolutely nothing in Prop A to keep a quality union organization from thriving. Freedom to Work law simply means unions will need to prove their worth to the workers they represent. The US Bureau of Economic Analysis (BEA) reported that from 2001 to 2016, private sector employment shot up by 27 percent in Freedom to Work states. Compare that to forced unionization states, which only grew 15.4 percent. BEA data also shows that from 2005 to 2015, GDP growth was 15.3 percent in Freedom to Work states, compared to just 11.9 percent in forced unionization states. That difference of 3.4 percent would go a long way in Missouri. Data from the Bureau of Labor Statistics shows that from 2005 to 2014, states with Freedom to Work saw a noticeable union membership growth of 1.3 percent. Membership in Non-Freedom to Work states, on the other hand, plunged down an average 9 percent. The U.S. Supreme Court backed the principle behind Freedom to Work law when it recently ruled in Janus v. AFSCME that employees shouldn’t be forced to subsidize an organization they don’t want to support. That ruling only applies to public employee unions, but passing Prop A will extend this protection to private-sector employees in Missouri as well. It’s economics 101: if there’s no competition, a business can charge more for goods and services. The very same principle of monopoly applies to unions. Data shows labor groups charge more and spend their money less efficiently when they can take workers’ dues for granted. A popular argument against Freedom to Work is that if workers aren’t required to pay dues, they will just freeload union benefits off the workers who do. But the idea that unions are legally required to represent non-members is a common misconception. In fact, the National Labor Relations Act allows labor groups to negotiate contracts that only cover workers who pay dues. While some opponents claim Prop A will lead to less worker pay, when it comes to real purchasing power, Freedom to Work states are the winners. U.S. Commerce Department data shows that when adjusted for cost of living, the average disposable income per capita in Freedom to Work states was nearly $2,250 higher than in the average forced-unionism state. As you can see, there are plenty of data-backed reasons to vote for Freedom to Work next month. In a nutshell, it boosts wages, grows jobs and promotes union accountability. Want to protect workers’ rights? Vote yes on Prop A.
August 7 is only a few weeks away. Check your voter registration and find out where to vote here, and learn more about Prop A at www.yesformoworkers.com.